Climate change and the increase of carbon dioxide in the atmosphere may result in conditions less favorable to reef building stony corals. The buildup of carbon dioxide in the atmosphere has had the effect of increasing oceanic acidity worldwide. When carbon dioxide reacts with water, atmospheric carbon dioxide transforms to carbonic acid. That acid damages hard corals, which secrete calcium carbonate to form a protective outer shell. Softer corals, cousins to the reef building corals, lack the hard outer skeleton that is damaged when the water turns acidic. The changing conditions could lead to a change in the makeup of coral communities. When you combine the less favorable conditions with the softer corals’ ability for rapid colonization, softer corals may out-compete hard corals. Stony corals are an important member of the underwater ecosystem. Their protective outer layers help provide shelter and habitats for many reef organisms, such as clownfish. Though it covers less than 1 percent of the ocean floor, hard coral reefs support about 25 percent of all marine life. Soft corals do not provide the same shelter to marine organisms, and their dominance could result in a major shift in the underwater environment. For more information about carbon dioxide and coral reefs, please read the full Huffington Post article. Sources from several prominent environmental groups say that President Obama will designate five new national monuments, including one in Maryland commemorating Harriet Tubman and the Underground Railway. The other four monuments are the First State National Monument in Delaware and Pennsylvania, the Rio Grande del Norte National Monument in New Mexico, Washington state’s San Juan Islands National Monument, and Charles Young Buffalo Soldiers National Monument in Ohio. The Antiquities Act, which allows the president to protect federal lands without congressional approval, was rarely invoked by President Obama during his first term. After an internal Interior Department list of potential monument sites became public, House Republicans threatened to repeal the act. Obama therefore kept his first four national monument designations to areas of cultural or historical significance. For more information, please read the full Washington Post article here. The fourth installment in Bethesda Green’s Finance Workshop Series will address the substance and process of the due diligence investment evaluation. Advice will also be given on how entrepreneurs should conduct due diligence on the potential investor. Speakers include John May of New Vantage Partners, Mahesh Konduru of Potomac Energy Fund, and David Levine of Geostellar. For more information, and to RSVP, please visit Bethesda Green’s Program Page. Join Rock Creek Conservancy and Casey Trees for an educational session on non-native invasive plants. Learn how to identify and control species of non-native invasive plants, including garlic mustard, mile-a-minute, and bush honeysuckle. 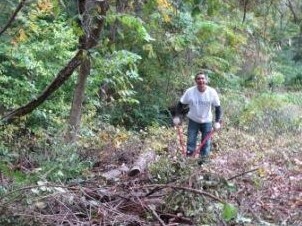 Once you’ve learned all about invasive plants, you’ll be ready for the Rock Creek Clean-up on Saturday April 6th! For more information, and to RSVP, please visit here. Has everyone thought of their Green Resolutions for 2013? My green resolution is to reduce waste by buying less and recycling more. Please share yours in the comments! The “Green Organization Supplement” legislation, introduced to the County Council in early December, would allow environmentally conscious organizations to apply for grants from the county for up to $25,000. Authored by Councilman Roger Berliner, the bill is part of the county’s effort to attract more green energy companies, following the recommendation that the County make a stronger commitment to green development. Applying companies would have to be audited by the Department of the Environment for environmental sustainability. The bill could be a big step for Montgomery County, making it an attractive location for green start-ups and providing a boost to the local economy. Introducing the bill now will allow the proposed funds to be included for consideration in the 2014 fiscal budget. A public hearing on the legislation has been set for January 22. For more information, please read the full Washington Examiner article, here. While kudzu is the most recognized (and most feared) of the invasive plant species, there are many other plants that pose a serious threat to Maryland’s native flora and landscape, and the Maryland Department of Agriculture is getting ready to take action. The Invasive Plants Advisory Committee was established in 2011 and given the task of creating a framework to rank species by their threat to the environment. Combining the USDA Animal and Plant Health Inspection Service’s protocols with Maryland-specific concerns, the framework will take into account: 1) a plant’s ability to spread, 2) its economic impact, 3) its risk of changing the environment, and 4) its risk of affecting human health. Plants deemed to be a threat will be assigned a rating of Tier 1 or Tier 2. Tier 1 plants will be banned from retail sale, and Tier 2 plants will require labeling informing consumers of their risks. Legislators hope that these steps will allow residents to participate in the protection of the environment, preventing the deliberate introduction of more invasive plants. Invasive plants have long been a problem in this region, with many becoming so common that people don’t even know they aren’t native. English ivy, bamboo, Bradford pears, honeysuckle, wild garlic, and day lily are all examples of invasive species we see everyday. These plants have all been introduced into the environment, often for landscaping and decorative purposes, and have spread so widely and aggressively that they’ve driven out their native competition. The lack of native plants can then affect native animals, who find themselves without food sources and habitats. If the invasive species takes a firm enough hold, it can cause a native species to go locally extinct. The Maryland legislation is designed to halt this process, and will be a valuable resource for residents wanting to learn more. To help stop invasive species on your own, consider native gardening, the practice of installing only plants found naturally in this region. Not only will your garden be a haven for local species, but with a variety of growing seasons, something new will always be blossoming! For more information on the legislation, please read the Maryland Gazette article here. For a list of invasive species in Maryland, please visit The Maryland Invasive Species Council. To learn more about native gardening, please visit the US Forest Service’s website, Celebrating Wildflowers. Teeming With Life: Bringing Gabon to the National Zoo, Friday January 11, 6:30 pm, Smithsonian National Zoo, 3001 Connecticut Avenue, NW. Join Smithsonian National Zoo scientist Alfonso Alonso for a presentation on Gabon’s Gamba Complex — a little-known region of Africa with remarkable species diversity. Dr. Alonso will be joined by National Zoo animal keeper Gil Meyers and National Zoo veterinarian Dr. Chris Whittier. Their panel discussion will address Gabon-related research projects at the Zoo, as well as provide information about the upcoming Gabon Gamba Complex exhibit to be displayed in the spring. The presentation will be followed by a reception with complimentary beer, wine, and light hors d’oeuvres. Tickets are $15 for FONZ members, $20 for non-members, and all proceeds will go toward improving the Cheetah Conservation Station and helping to bring new African wildlife species to the Zoo. For information, and to purchase tickets, please visit Smithsonian National Zoo’s website. 2013 “Keep Winter Cold” Polar Bear Plunge Hosted by Chesapeake Climate Action Network, Saturday January 26, 11 am, The Beach at National Harbor, Maryland. Concerned about climate change, and want to make a difference? Register for Chesapeake Climate Action Network’s 8th Annual “Keep Winter Cold” Polar Bear Plunge and help make a difference! While some people might think it takes a crazy person to jump in the Potomac in January, Chesapeake Climate Action Network knows that great people coming together for a great cause can do incredible things – including willingly going into chilly Potomac waters! The event is the organization’s annual priority fundraiser, and helps them move toward their goal of creating swift action at local, state, and national levels, and getting the DC Metropolitan Area away from fossil fuels. Showing her commitment to the environment, Congresswoman Donna Edwards (D-MD), will be joining in the plunge for her third consecutive year! To register for this fun event and help out an important cause, visit www.keepwintercold.org. Grow Community Gardens While You Shop! Wednesday, January 9, Whole Foods Markets. 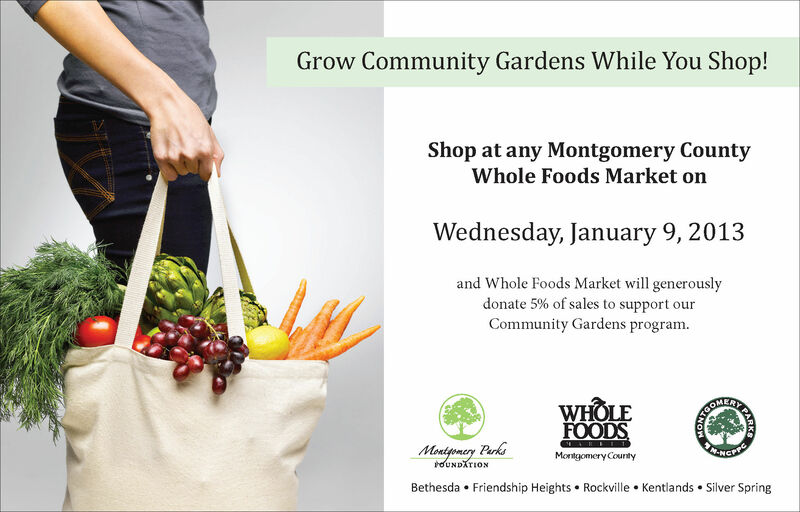 This Wednesday January 9, shop at any Montgomery County Whole Foods Market, and Whole Foods will donate 5% of sales to support the Community Gardens Program. Participating stores include Bethesda, Friendship Heights, Rockville, Kentlands, and Silver Spring.